Draft: 2004, Chicago Cubs, 17th rd. Jerry Richard Blevins was originally signed by Cubs scout Brian Williams…graduated from Arcadia (OH) high school in 2001 and was inducted into the school's Hall of Fame…attended the University of Dayton where he was a walk-on to the Flyer's baseball team…pitched for the 2007 USA World Cup team that won the gold medal in Chinese Taipei. Spent the entire season with New York (NL) and went 3-2 with a save and a 4.85 ERA in 64 games, including the first start of his career…yielded a .225 opponents batting average, which was his lowest since 2013 with Oakland (.218)…however, walked 22 batters in 42.2 innings and his average of 4.64 walks per nine innings was a career-high…allowed 9-of-40 (22.5%) inherited runners to score, which was the eighth lowest mark in the National League…has allowed 91-of-360 (25.3%) to score in his career which is seventh lowest among all Major Leaguers since he made his debut in 2007…picked off a career-high three batters, which tied for 10th among all NL pitchers…hit a career-high tying five batters…his opponents batting average broke down to .193 (17-for-88) against right-handed hitters compared to .264 (19-for-72) against left-handers…yielded a .151 average with the bases empty, .328 with runners on…opponents hit .353 with runners in scoring position…first batters faced were 9-for-55 (.164) with four walks (.242 on-base percentage), two doubles and a home run (.255 slugging percentage)…had a .125 average with no outs, .212 with one out and .317 with two outs…had a 3.43 ERA and .184 opponents batting average in 29 appearances at home, a 6.23 ERA and .262 opponents average in 35 games on the road… in four seasons with the Mets he logged a 2.33 ERA and .184 opponents average in 107 games at Citi Field compared to a 4.55 ERA and .261 average in 112 outings on the road…posted a 2.89 ERA in 17 outings on no days rest, a 5.17 ERA in his other 46 relief appearances…logged a 1.59 ERA from the eighth inning on, an 8.55 ERA prior to that…did not allow a run in five interleague appearances (4.0 ip). when he compiled a 2.00 ERA and .182 opponents batting average in 13 games…did not walk a batter and struck out 11 in 9.0 innings…then posted a 9.39 ERA in 10 games in September…struck out a season-high tying three batters in 1.0 inning Sept. 13 against Miami. Became the third pitcher in team history to win six or more games without a loss in a single season...The other two were Tom Gorman (6-0 in 1984) and Pat Mahomes (8-0 in 1999)...Was tied for seventh in the majors with a career-high 75 outings...Pitched in 73 games in 2016...Is one of 10 relievers to appear in 70 or more games in each of the last two years...Allowed five runs in 21.0 innings (2.14 ERA) after the All-Star break, going 2-0...Stranded 36 inherited runners, tied for the ninth-most in the majors...Over the last two years is second in the majors with 83 stranded runners...Only Marc Rzepczynski has more (86)...Has the fourth-lowest exit velocity (81.8) among relievers over the last three years (min. 50.0 innings)...Has the highest swing and miss rate (46.1) by a lefthander throwing a curveball over the last three years (min. 20.0 innings)...Led team with 19 holds...Had 69 strikeouts in 49.0 innings (12.67 strikeouts per nine innings)...He struck out a career-high 31.8 percent of the batters he faced...Made his 500th career appearance on September 30 at Philadelphia...Is one of seven active lefthanders who has pitched in at least 500 games...The others are Boone Logan (619), Craig Breslow (576), Oliver Perez (552), Tony Sipp (526), CC Sabathia (509) and Mike Dunn (502)...Research courtesy of Elias...Earned his first save of the season on July 21 vs. Oakland after pitching 1.2 innings of scoreless relief in a 7-5 win...It was his first save since September 18, 2016 vs. Minnesota and the fifth save of his career... The five-out save was the longest of his career...The last time he worked 1.2 innings or more was September 25, 2014 with Washington vs. the Mets when he pitched 2.0 innings...Was 2-0 with a 0.74 ERA (two earned runs/24.1 innings) at home (35 games)...Held lefthanded batters to a .197 (24-122) batting average and righties to a .288 (19-66) mark...Was unscored upon in 63 of his 75 outings. Made a career-high 73 appearances...Previous best was 67 games in 2013 with Oakland...Has pitched in 60 or more games in four of the last five years...Stranded 47 of 55 inherited runners, tied for the most stranded runners in the majors with San Francisco's Javier Lopez...Was unscored upon in 19 of his final 21 outings... Ranked second on the team with 16 holds...Earned his first save of the season on September 13 at Washington...Was his first save since September 11, 2012 with Oakland...Converted his second save on September 18 vs. Minnesota...Held opponents to a .167 (6-36) average with runners in scoring position... Did not allow a run over 21 games from April 30-June 22, the second-longest streak in team history...Had a 13.0 scoreless inning streak during that span....Lefthanded batters batted .255 (26-102) while righthanded hitters batted .182 (10-55). Was on the roster for the Wild Card Game vs. San Francisco but did not pitch. Made seven appearances for the Mets after being acquired from Washington on March 30 in exchange for outfielder Matt den Dekker... Placed on the 15-Day Disabled List on April 21...Fractured his left forearm when he was struck by a Dee Gordon line drive on April 19 vs. Miami...Did not allow a hit or a run in his seven outings with the Mets (5.0 innings pitched)...Earned his only decision of the season (a win) with 0.2 innings of scoreless relief on April 16 vs. Miami...Lefthanded batters did not have a hit in 14 at bats...Righthanded batters were 0-for-1...Re-fractured his left forearm on August 3 when he fell off a curb in Port St. Lucie, FL. Served Matt Williams as the primary lefthander in the Nationals' bullpen for the majority of the 2014 campaign...Struck out a career-high 66 batters in fewer innings (57.1 IP) than his previous two seasons...Improved his groundball rate to 38% in 2014 (31% in 2013)...Allowed only 11.4% (4 of 35) of inherited runners to score, good for fifth in MLB (fourth in the NL)...Posted a stingy .229 batting average against and career-best 10.4 strikeouts per nine innings, but struggled with a .313 BABIP...Finished a career-high 25 games...Struck out 11 of 18 batters from Sept. 12-27, including five straight over two appearances (9/12, 9/17)...Finished the season very strong, allowing just one hit while striking out 13 and walking one over his final eight appearances (8.2 IP) including the Postseason. Member of OAK's Opening Day roster for 5th straight year...went perfect 5-0 with a 3.15 ERA in a career-high 67 games...stingy .218 batting average against included a .190 (23-for-121) mark against right-handed hitters (.253 against LHB)...notched a 5.6/1 strikeouts-to-walk ratio when facing left-handed batters...posted a .156 batting average against with 2 outs...batting average against in 35 appearances on the road was .202 (23-for-114)...inherited 45 base runners (10th in AL) and allowed 16 to score...ERA was 1.61 through June 9, 4.50 thereafter...worked less than 1.0 inning in 27 times in 65 appearances...posted at least one strikeout in 9 consecutive games from May 14 to June 4...for the 4th time in career, worked career-high 2.2 innings on Aug. 25 at BAL. Completed his sixth season in an Oakland uniform, but it was just his second full season (2010)...was 5-1 with a save, a 2.48 ERA and a .201 opponents batting average in 63 relief appearances...the ERA and opponents batting average were the lowest marks of his career...had career-highs in wins, innings pitched (65.1) and strikeouts (54) and matched his best in games pitched...also issued his most walks (25), hit his most batters (5), had the first two wild pitches of his career and matched his highs in runs (20) and home runs (7)...his .201 opponents batting average broke down to .182 (20-for-110) against left-handed hitters compared to .219 (25-for-114) against right-handers...issued 18 of his 25 walks to righties...held lefties to a .248 on-base percentage...opponents hit .160 with runners on base...had a .182 opponents batting average over his first 15 pitches in a game, .246 after that...allowed 12 of 45 (26.7%) inherited runners to score...first batters faced were 14-for-56 (.250) with four walks...allowed six first batter home runs, which was second most in the American League and the most by an Oakland reliever since at least 1974...had the fourth highest first batter slugging percentage in the AL (.607)...13 of the 21 home runs he has allowed in his career have been to the first batter he faced in a game, which is the most by an Athletic since 1974...surrendered six of his seven home runs in Oakland...compiled a 5.06 ERA in 12 appearances on no days rest compared to a 1.98 ERA in his other 51 outings...had a 1.87 ERA against the AL compared to 7.04 in six interleague appearances...now has a 6.00 ERA (8 er in 12.0 ip) in 14 career interleague appearances...posted a 2.03 ERA at night compared to 3.43 during the day...has a 2.80 ERA (42 er in 135.0 ip) in 136 career appearances at night compared to 4.38 (35 er in 72.0 ip) in 78 games during the day. Was on the A's Opening Day roster but had six stints with Oakland in 2011...had no decisions, a 2.86ERA and .235 opponents batting average in 26 appearances...the ERA was the lowest of his career buthe allowed 8 of 14 (57.1%) inherited runners to score, which was the highest percentage of his career...compiled a 4.40 ERA in 15 games before the All-Star Break and a 1.29 ERA in 11 appearances after thebreak...walked 13 batters in 14.1 innings before the break, just one in 14.0 innings after the break...his opponents batting average included a .220 (13 for 59) mark against right-handed hitters comparedto .256 (11 for 43) against left-handers...allowed both of his home runs to lefties...opponents hit .167with the bases empty, .313 with runners on (including .313 with runners in scoring position)...they werealso 2-for-2 with a walk and six RBI with the bases loaded...first batters faced were 6-for-23 (.261)with three walks...posted a 1.54 ERA in 11 appearances at home compared to 3.78 in 15 outings on theroad...had a 1.74 ERA in 10 games during the day and a 3.50 ERA in 16 night games...compiled a 1.35ERA in the eighth inning or later, 6.48 in the seventh inning or earlier...tied for sixth among AmericanLeague relievers in triples allowed (2) and tied for eighth in unearned runs (5)...did not allow a run inhis only appearance against Kansas City (2.0 ip) and has not allowed a run in 12 career games against theRoyals (11.0 ip)...tossed at least one inning in 16 of his 26 outings, including two or more eight times. OAKLAND: Began the season with the A's, posting a 4.61 ERA and .250 opponents batting average in14 games during his first stint...struck out a season-high three batters and tossed 2.0 scoreless inningsApril 3 against Seattle...compiled a 6.23 ERA and allowed all six of his inherited runners to scoreover a five-game span from April 10-22...pitched a season-high 2.1 innings April 12 at Chicago...yielded a season-high three runs, all of which were unearned, April 30 against Texas...was optioned toSacramento May 11 and each of his next four stints lasted three days or fewer...appeared in just onegame during each of his stints from May 20-22, July 16-18 and July 30 to Aug. 1...joined the A's Aug.26 in Boston for his fifth stint, pitching twice (3.00 ERA) before he was sent down between games ofthe doubleheader Aug. 27...returned for the final time Aug. 31 and did not allow a run in his final sevenappearances (7.0 ip, 3 h, 0 bb, 6 so), retiring 21 of the 25 batters he faced...finished the season with a9.0 inning scoreless streak, which was two-thirds of an inning short of his career high...matched hisseason-high with three strikeouts and retired all six batters he faced Aug. 31 at Cleveland...set down sixof seven in his next outing Sept. 6 against Kansas City. SACRAMENTO: Was 2-0 with a 4.85 ERA in 27 relief appearances with Sacramento...allowed a .227opponents batting average, which broke down to .188 (9 for 48) against left-handed hitters and .258 (16for 62) against right-handers...surrendered all three of his home runs to righties...struck out 35 in 29.2 innings, an average of 10.62 per nine innings...had a .143 opponents batting average with the basesempty, .340 with runners on...opponents hit .409 with runners in scoring position and two outs...posteda 0.77 ERA in 10 appearances at home, compared to 7.50 in 17 games on the road...allowed all threeof his home runs on the road...allowed 2 of 12 (16.7%) inherited runners to score...tagged for sevenruns on seven hits in 4.0 innings in three appearances during his first stint with the River Cats from May11-19 (15.75 ERA), including a season-high four runs in 0.2 innings May 17 at Nashville...finishedMay with a 14.14 ERA but did not allow a run in seven appearances in June (9.1 ip, 2 h, 2 bb, 12 so)...had a 13-game, 15.1-inning scoreless streak from June 1 to July 27...opponents were 6-for-50 (.120)with two walks during the streak...posted a 4.26 ERA in seven appearances during his final stint withSacramento from Aug. 3-25. The 2010 season was his fourth in the majors but it marked the first time he spent the entire year at thebig league level...was 2-1 with a save and a 3.70 ERA in a career-high 63 appearances...the save wasthe first of his career...allowed seven home runs in 48.2 innings after yielding five home runs in 64.2innings over his first three seasons combined...four of the seven home runs came against the first batterhe faced in an outing, which tied for the American League lead...has surrendered seven of his 12 careerhome runs to first batters faced...allowed 12 of 34 (35.3%) inherited runners to score, which was thesixth highest percentage in the AL, and first batters faced were 15 for 59 (.254) with four walks...yieldeda .274 opponents batting average, including .231 (21 for 91) against left-handed hitters and .311 (33for 106) against right-handers...issued 14 of his 18 walks and allowed five of his seven home runs torighties...his career splits are .227 (42 for 185) against lefties and .276 (71 for 257) against righties...30of his 39 walks and nine of his 12 home runs have come against right-handed hitters...had a 5.00 ERAin 38 outings on one day of rest or less compared to a 2.08 ERA in 25 appearances with two days or restor more...posted a 2.37 ERA and .248 opponents batting average in 41 games at night compared to an8.44 ERA and .354 opponents average in 22 outings during the day...did not allow a run in five outingsagainst Kansas City (2.2 ip) and has not allowed a run in 11 career appearances against the Royals (9.0ip)...tossed fewer than one inning in 34 of his 63 outings. OAKLAND: Tossed a season-high 2.0 scoreless innings in his first outing April 5 against Seattle, amark he would match May 26 at Baltimore and Aug. 30 at New York...picked up both of his wins overhis first seven games of the season, April 7 against Seattle and April 17 against Baltimore...allowed aseason-high three runs on a season-high three hits in 0.2 innings May 15 at Los Angeles...that startedan eight-batter stretch through May 18 where the opposition went 7-for-7 with a sacrifice hit and scoredfive runs...finished May with a 7.71 ERA and .406 opponents batting average...struck out a career-hightying four batters in 2.0 innings May 26 at Baltimore (also Sept. 24, 2009 vs. Texas)...issued a careerhighthree walks and was charged with the loss June 17 at Chicago (NL)...had a career-high tying 9.2inning scoreless streak over a 13-game stretch from June 25 to July 23...allowed six hits, did not walk abatter and struck out nine during the streak...made his 100th career appearance July 7 against New Yorkwhen he tossed a scoreless seventh inning...posted a 1.00 ERA with no walks in 13 games in July (9.0ip)...now has a 0.83 ERA (2 er in 21.2 ip) in 25 career appearances in July...was charged with his onlyblown save of the season Aug. 18 against Toronto when he entered the game with the bases loaded anda 4-2 lead, and allowed a two-run single to Lewis...came back the next day to retire the side in order inthe ninth inning of the A's 4-3 win over Tampa Bay for his first Major League save...tossed a career-high43 pitches over 2.0 shutout innings Aug. 30 at New York...hurled a scoreless sixth inning Sept. 15 at Kansas City but that would be his last outing of the season due to a left shoulder strain...had surgery torepair a labrum tear in his left hip following the season. Made the A's Opening Day roster for the first time and had three stints with Oakland, compiling a 4.84ERA in 20 relief appearances...posted a 12.46 ERA in five relief appearances over his first two stints butreturned when rosters expanded in September to compile a 3.00 ERA in 15 appearances...allowed a .229batting average overall, which was the lowest mark of his three seasons in the majors...that included a.218 (12 for 55) mark against right-handed hitters and .250 (7 for 28) against left-handers...walked justsix while striking out 23 in 22.1 innings...yielded a .190 average with runners in scoring position andnow has a .219 (14 for 64) career opponents average with RISP...posted a 0.90 ERA and .147 opponentsaverage in 11 outings at night and had an 8.03 ERA and .286 opponents average in nine day games...owned a 2.70 ERA and .167 opponents batting average in seven outings on the road and a 5.74 ERAand .254 opponents average in 13 appearances in Oakland...allowed 2 of 9 (22.2%) inherited runnersto score and first batters faced were 4 for 18 (.222) with a pair of walks...has allowed 7 of 36 (19.4%)inherited runners to score in his career. Spent the first three months of the season at Triple-A Sacramento where he was 2-2 with a 2.78 ERA and 10 savesin 28 relief appearances...was promoted to Oakland on July 4 and spent the remainder of the season with the A's,going 1-3 with a 3.11 ERA in 36 relief appearances...allowed a .230 opponents batting average with Oakland, whichincluded a .193 (11 for 57) mark against left-handed hitters and .256 (21 for 82) against right-handers...allowed bothof his home runs against righties and had a .402 slugging percentage against righties and .228 against lefties...allthree of his career home runs have been hit by right-handers...allowed 5 of 24 (20.8%) inherited runners to scorebut first batters faced were 10 for 31 (.323) with three walks...yielded a .271 batting average with the bases emptyand .188 with runners on base...including .179 with runners in scoring position...opponents were 0 for 8 with thebases loaded...did not allow a run in 12 outings on no days rest (10.0 ip)...had a 0.81 ERA in 21 outings on oneday rest or less and a 6.46 ERA in his other 15 outings...compiled a 0.98 ERA and .133 opponents batting averagein 17 outings in Oakland compared to a 5.12 ERA and .304 opponents batting average in 19 appearances on theroad...now has a 1.33 ERA (3 er in 20.1 ip) and .159 (11 for 69) opponents batting average in 20 career gamesin Oakland and a 6.14 ERA (15 er in 22.0 ip) and .312 (29 for 93) opponents batting average in 22 outings on theroad...had a 1.69 ERA in 15 games during the day and 4.15 in 21 outings at night...committed three errors in sixtotal chances and tied for eighth among all American League pitchers in errors. Began the season with Single-A Daytona of the Florida State League in theChicago Cubs organization but finished it in the Major Leagues withOakland...had a loss and a 9.64 ERA in six relief appearances with the A'sand allowed a .348 opponents batting average...left-handed hitters were 3for 9 (.333) and right-handers were 5 for 14 (.357) with a homerun...opponents were 3 for 4 (.750) with runners in scoringposition...stranded all three of his inherited runners and first batters facedwere 2 for 6 (.333) with a home run...was selected from Triple-A Sacramentoon September 15 after the River Cats won the Pacific Coast LeagueChampionship and made his ML debut with Oakland on September 16against Texas...entered the game in the ninth inning with the A's trailing11-9 and retired the side in order...struck out the first batter he faced,David Murphy...his longest outing came on September 21 at Clevelandwhen he tossed 1.2 scoreless innings and retired all five batters that hefaced...allowed at least one run in three of his six outings with theA's...including September 26 at Boston when he allowed four runs onthree hits and a walk without retiring a batter...was charged with the lossas he entered the game in the sixth inning with the score tied at five...wasa combined 5-5 with a 1.63 ERA in a career high 56 relief appearanceswith four minor league teams in two different organizations...convertedall 10 of his save opportunities and allowed 5 of his 25 (20.0%) inheritedrunners to score...walked just 18 and struck out a career high 102 in a career high 77.1 innings...had a strikeout to walk ratio of 5.67 and averaged11.87 strikeouts per nine innings...yielded just three home runs, orone every 25.8 innings...allowed a .200 opponents batting average, whichincluded .198 (38 for 192) against right-handed hitters and .205 (17 for 83)against left-handers...allowed all three of his home runs against righthanders...opponents were 13 for 66 (.197) with runners in scoringposition...was acquired by the A's from the Chicago Cubs along with RobBowen in exchange for Jason Kendall and cash considerations on July16...was assigned to Double-A Midland following the trade and was 1-3with a save and a 3.32 ERA in 17 relief appearances with theRockhounds...struck out the side on July 25 against Frisco for his onlysave...added a season high five strikeouts in 2.0 innings against Frisco onAugust 1...was 0-3 with a 4.60 ERA over his first 14 outings and then didnot allow a run over his final four outings beginning on August 22 (6.0 ip,1 h, 9 so)...was promoted to Triple-A Sacramento on August 31 and madeone regular season appearance with the River Cats on September 1 at Tucson(2.2 ip, 1 h, 4 so)...then went 1-0 with two saves in four postseasonappearances for Sacramento and did not allow a run in 9.0 innings (4 h, 2bb)...struck out 20 of the 33 batters he faced...did not allow a run over hisfinal 17.2 minor league innings...began the season at Single-A Daytona inthe Cubs organization and was 1-0 with six saves and a 0.38 ERA in 15appearances...allowed just one run in 23.2 innings and did not yield ahome run...right-handers were just 8 for 62 (.129)...did not allow a runover his first seven outings (11.0 ip) or his final seven (10.2 ip)...waspromoted to Double-A Tennessee on May 15 and was 2-2 with three savesand a 1.53 ERA in 23 appearances with the Smokies...allowed just onerun over an 18-game span from May 20 to July 1 (1 er in 24.0 ip, 0.38ERA)...that included a 10-game scoreless streak from May 20 to June 8(12.0 ip, 7 h, 2 bb, 15 so)...went 15 consecutive games without a walkfrom May 26 to July 1 (20.2 ip)...tossed a season high 3.0 scoreless innings(0 h, 0 bb) and picked up the win on July 1 against Mississippi. Combined for a 1-3 record, two saves and a 6.13 ERA in 29 games with Single-A Daytona, shortseason Single-A Boise and Double-A West Tenn...allowed a .301 opponents batting average, whichincluded a .288 mark against right-handed hitters and .341 against left-handers...allowed all three of hishome runs against righties...his opponents average jumped to .375 with runners in scoring position althoughthat number dropped to .190 with RISP and two outs...began the year in extended spring trainingand was sent to Daytona May 23...was 0-1 with a save and a 9.00 ERA in eight relief appearances withthe Cubs...was transferred to Boise of the short season Northwest League June 18 and was 1-2 with a6.04 ERA in 16 games with the Hawks...was promoted to West Tenn Aug. 23 and ended up posting hisbest numbers in his Double-A debut...had one save and compiled a 1.42 ERA in five relief appearanceswith the Diamond Jaxx. Spent the entire season at Single-A Peoria and was 3-7 with 14 saves a 5.54 ERA in 48 games,including two starts...finished third in the Cubs farm system in saves and was second among MidwestLeague relievers with an average of 12.21 strikeouts per nine innings...struck out 90 batters in 66.1innings in relief and fanned 96 batters in 76.1 innings overall (11.32 per nine innings)...led Peoria inappearances and saves...converted 14 of 19 (73.7%) save opportunities...allowed a .260 opponents battingaverage, which included a .246 mark against left-handed hitters and .263 against right-handers...allowed five of his six home runs to righties...opponents hit .162 with runners in scoring position andtwo outs...struck out a season high seven in 4.0 innings of relief July 15 at Burlington and matched thatfigure with seven strikeouts in 3.0 innings Aug. 27 against West Michigan...picked up the win in hisfirst professional start July 27 in the second game of a doubleheader against Daytona (5.0 ip, 3 h, 1 r, 1er, 1 bb, 5 so). Made his professional debut at Single-A Boise of the short season Northwest League and was6-1 with five saves and a 1.62 ERA in 23 relief appearances...was named to the NWL PostseasonAll-Star Team...tied for the Hawks team lead in wins and saves...held the opposition to a .145 battingaverage...allowed just one home run in 33.1 innings and struck out 42, an average of 11.34 per nineinnings...did not allow a run over his final 15 regular season outings (22.2 ip)...then had three saves inthree post season appearances (3.1 ip, 3 h, 1 r, 1 bb, 4 so) as Boise swept Vancouver in the best of fiveNorthwest League Championship Series. February 18, 2019 LHP Jerry Blevins assigned to Las Vegas Aviators. February 5, 2019 Oakland Athletics signed free agent LHP Jerry Blevins to a minor league contract and invited him to spring training. October 29, 2018 LHP Jerry Blevins elected free agency. 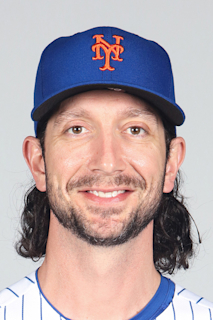 July 9, 2018 New York Mets activated LHP Jerry Blevins. July 6, 2018 New York Mets placed LHP Jerry Blevins on the bereavement list. May 18, 2018 New York Mets activated LHP Jerry Blevins from the paternity list. May 15, 2018 New York Mets placed LHP Jerry Blevins on the paternity list. February 9, 2017 New York Mets signed free agent LHP Jerry Blevins. November 3, 2016 LHP Jerry Blevins elected free agency. December 15, 2015 New York Mets signed free agent LHP Jerry Blevins. November 2, 2015 LHP Jerry Blevins elected free agency. March 30, 2015 New York Mets traded CF Matt den Dekker to Washington Nationals for LHP Jerry Blevins. December 11, 2013 Oakland Athletics traded LHP Jerry Blevins to Washington Nationals for LF Billy Burns. August 31, 2011 Oakland Athletics recalled Jerry Blevins from Sacramento River Cats. August 30, 2011 Oakland Athletics optioned LHP Jerry Blevins to Sacramento River Cats. August 28, 2011 Oakland Athletics designated Jerry Blevins for assignment. August 26, 2011 Oakland Athletics recalled Jerry Blevins from Sacramento River Cats. August 3, 2011 Oakland Athletics sent Jerry Blevins outright to Sacramento River Cats. August 3, 2011 Oakland Athletics optioned Jerry Blevins to Sacramento River Cats. August 2, 2011 Oakland Athletics designated Jerry Blevins for assignment. July 30, 2011 Oakland Athletics recalled Jerry Blevins from Sacramento River Cats. July 20, 2011 Oakland Athletics optioned Jerry Blevins to Sacramento River Cats. July 19, 2011 Oakland Athletics designated Jerry Blevins for assignment. July 16, 2011 Oakland Athletics recalled LHP Jerry Blevins from Sacramento River Cats. July 7, 2011 Jerry Blevins roster status changed by Sacramento River Cats. June 25, 2011 Sacramento River Cats placed LHP Jerry Blevins on the 7-day disabled list. May 24, 2011 Oakland Athletics optioned LHP Jerry Blevins to Sacramento River Cats. May 24, 2011 Jerry Blevins assigned to Sacramento River Cats from Oakland Athletics. May 23, 2011 Oakland Athletics designated Jerry Blevins for assignment. May 20, 2011 Oakland Athletics recalled LHP Jerry Blevins from Sacramento River Cats. May 11, 2011 Oakland Athletics optioned Jerry Blevins to Sacramento River Cats. May 11, 2011 Jerry Blevins assigned to Sacramento River Cats. May 11, 2011 Jerry Blevins assigned to Oakland Athletics. September 1, 2009 Oakland Athletics recalled Jerry Blevins from Sacramento River Cats. May 15, 2009 Oakland Athletics optioned Jerry Blevins to Sacramento River Cats. May 4, 2009 Oakland Athletics recalled Jerry Blevins from Sacramento River Cats. April 18, 2009 Oakland Athletics optioned Jerry Blevins to Sacramento River Cats.